“How do you use 3D printing for more than printing toys?” asked Lisa Merrifield (East Central ISD), a workshop participant at a TCEA Makers event held in mid-May, 2018. The question is one I’ve heard time and again, not just for 3D printing. Getting students engaged with new technologies (e.g. 3D printing, Micro:bit, Minecraft: Education Edition, MakeCode) isn’t difficult. What can be tough is setting up environments where students grapple with a real-life problem that requires an engineered solution. In this blog entry, we’ll explore design thinking, share a design thinking lesson plan format you can adapt for your own needs, and more. Let’s begin. A wealth of information exists about design thinking. Some large urban school districts are embracing it at elementary, middle, and high school. One person contacted me this past May sharing that she would be responsible for professional development. Before we explore some of the questions she asked, let’s take a look at how some define it. To save space and time, and since I’ve embedded the recursive process (with explanations) in my version of a Design Thinking lesson plan, I’ll skip the longer explanation. You can read the short version of my explanation online. 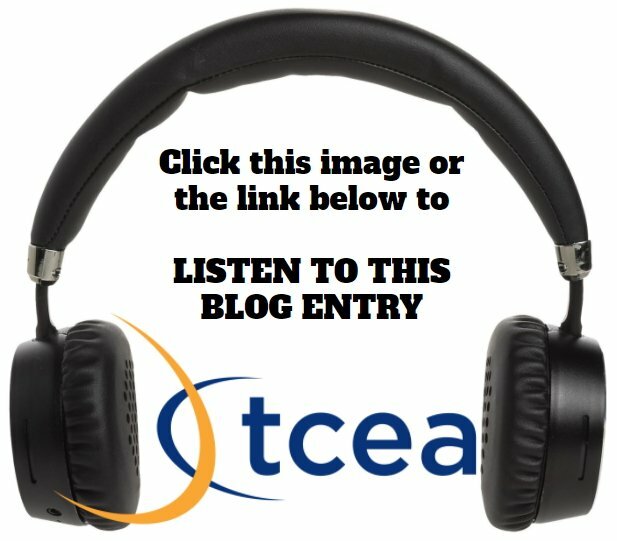 How Do I Begin Planning a Design Thinking Lesson? 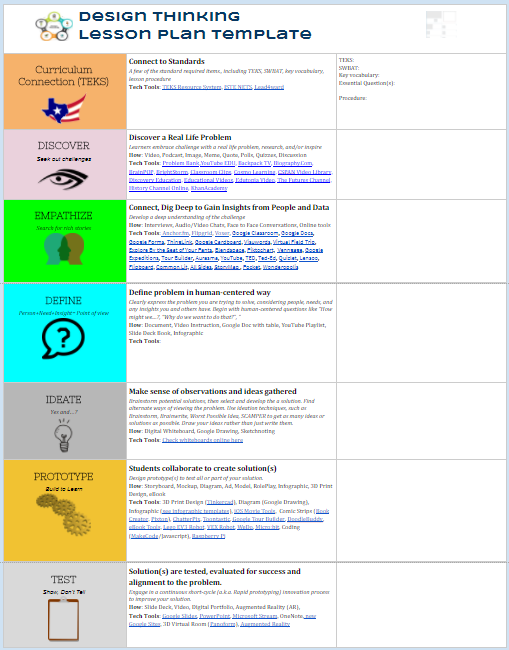 To respond to this request, I took the liberty of adapting a variety of online resources to create my own design thinking lesson plan form. This lesson plan template is designed to be completed online in digital format, either as a Word Online or Google Docs document. Source citations are included in the full-size version linked above. (A quick aside: Future design thinking blog entries will feature actual examples for 3D printing and coding). How Do We Create a “Design Thinking” Classroom? Create your own problem bank. Using a tool like Microsoft or Google Forms, invite others to share their problems. For example, for 3D printing, see this Design Thinking Problem Bank. You may also want to read How to Create Your Own Problem Bank and What Makes a Good Problem Bank. Put students in charge of selecting problems. Use a rubric like this one (click the link to get a copy) to get started. Remember, selecting a problem is a pre-Design Thinking process step. As a teacher you can do it, but it is better to empower students to empathize, ideate, and define the problem. Focus students on engineering as a key component (Source: Kindling STEM Learning). Given access to 3D printers and coding solutions, engineering a solution first with spaghetti noodles and marshmallows or duct tape wallets, can be powerful, inexpensive alternatives. Find more projects online. As you begin to institutionalize approaches like design thinking in your organization, support teachers’ efforts. To accomplish that, provide baseline design thinking professional learning. Also, put together design thinking projects and easy-to-gather resource collections to support these efforts. While some campuses executed FOSS kits with fidelity, others have flopped due to lack of access to supplies. Implementing a resource-intensive program isn’t new; just requires a systemic, systematic approach. Another component must involve instructional coaching that supports teachers in the field.